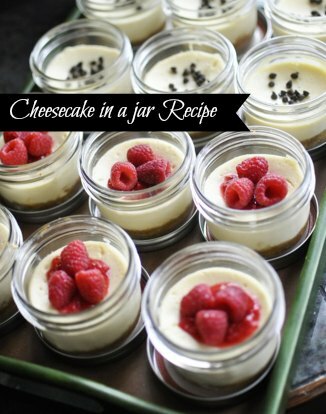 I personally think this is the best cheesecake in a jar recipe ever. We often alternate the crust between graham crackers and Oreo cookies. 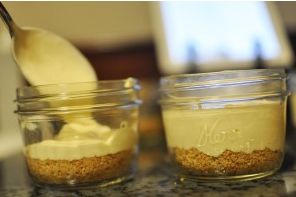 I personally prefer to a bake recipe instead of a no bake cheesecake recipe. Top the recipe with your favorite fruit and you have a special treat! I put the graham crackers into a zip lock baggie and start crushing them. Use a rolling pin if needed. Combine the graham crackers, melted butter and sugar to finish crust. Press about 2 tablespoons into the bottom of each jar. Next you will begin to make the cheesecake filing. Whip the softened cream cheese in a mixer on medium to high speed for 2 minutes or until it’s fluffy. Don’t forget to scrap the sides and get all of the cream cheese so you won’t have lumps. Slowly add the condensed milk until it’s smooth. Next add the eggs and vanilla and mix it well. Scoop the batter into each jar equally. I seemed to have added about 3 scoopfuls in each small jar. Be sure not to fill it to the top. Finally use a casserole pan and add the jars. Fill the pan with water until it covers half of the jar. Bake them at 350 degrees for about 25 minutes or until they no longer jiggle. Immediately remove them from the hot water and let them cool. I put mine in the refrigerator overnight. Add your favorite topping and enjoy! I’ve made this recipe a few times and we love it! We also like to change up the crust and use Oreo cookies in place of graham crackers too. I think that is our absolute favorite! I will have to make this for my husband – he LOVES cheesecake!